Franz Schubert’s only significant work for flute is an offshoot of his famous song-cycle 'Die schöne Müllerin', completed in November 1823. In January 1824 he took the melody of the 18th song, ‘Trockne Blumen’ (Faded Flowers) and made it the basis of his Introduction and Variations in E minor on ‘Trockne Blumen’ for flute and piano. It may have been composed for Schubert’s friend Ferdinand Bogner, a professor of flute at the Vienna Conservatory, but it remained unpublished – and perhaps unperformed – until 1850, when the work was issued posthumously as Schubert’s op.160. Since then it has formed an essential part of the flute repertoire. Beethoven’s only mature and substantial contribution to the instrument’s repertoire is the Serenade, op.25 for flute, violin and viola, written in 1801. In 1803, the Bohemian composer Franz X Kleinheinz (1772-1832), who had recently arrived in Vienna to study with Beethoven’s old teacher Albrechtsberger, arranged this work for flute (or violin) and piano. The arrangement was obviously carried out with Beethoven’s full approval, as he is known to have checked it over and sanctioned it before it was printed in December, 1803. Robert Schumann wrote no original pieces for flute. However, it is but a small leap for flautists to include the 3 Romanzen op.94 in their repertoire. They were written in 1849, for oboe, but with the composer’s indication that they were suitable for either clarinet or violin. The Romanzen are simply ‘Songs without Words’, and as such open to all instrumental colours equally. 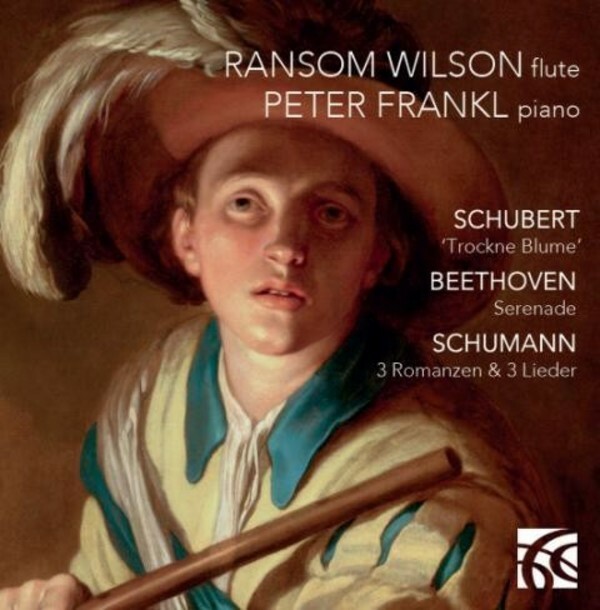 Ransom Wilson has long been recognized internationally as one of the greatest flutists of his generation. After graduation from the Juilliard School in 1973, he spent a year in Paris as a private student of Jean-Pierre Rampal. In 1976 he gave his official debut concert in New York City, with Rampal as his guest artist. An exclusive recording contract with Angel/EMI followed soon after, along with extensive performances all over the world. Ransom Wilson is an Artist of the Chamber Music Society of Lincoln Center, Professor of Flute at Yale University, Conductor at Suny Purchase, Assistant Conductor at the Metropolitan Opera, Artistic Director of Le Train Bleu ensemble, Music Director of the Lar Lubovitch Dance Company, and Artistic Director of the NY State Summer School of the Arts, School of Orchestral Studies.